Handmade home decor items are trending right now but can be a little pricey. Today I have such a project with you that will be easy on your wallet. It is my turn to share an Altered Art Project over at The Robin's Nest Blog. I love working with their products, especially all those yummy and precious looking gems called Dew Drops. 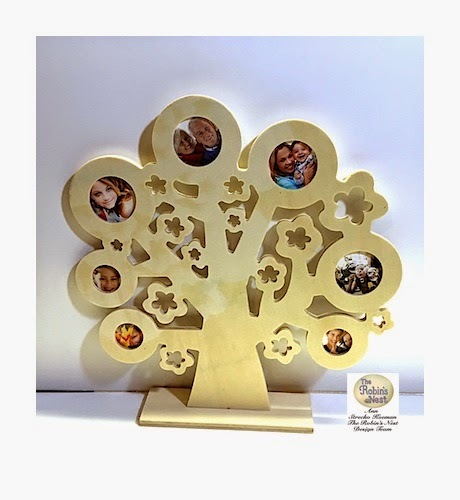 I turned this plain looking wooden photo tree into a pretty piece for my home by using the Cowboy Dew Drops from The Robin's Nest. Other supplies included Metallic paste in dark brown, strong glue, Rub ons "Family" by the Robin's Nest. To see how I transformed and made this project you will have to follow the link over to their blog. Thank you for stopping by, and come back soon!